Despite thorough works previously devoted to our close neighbour alpha Centauri, its distance is still far from being carved in stone. Any derivation of the individual masses is therefore uncertain, if not questionable. And yet, that does not prevent this system from being used for calibration purpose in several studies. By combining measurements of the binary separation with 10 years of radial-velocity data obtained with the HARPS spectrograph at ESO, Pourbaix and Boffin were able to derive a full 3D orbit of alpha Cen. They locate alpha Cen right where the ESA Hipparcos satellite had put it. The masses of the setellar components could be derived accurately, and appear to be a bit more massive than previously thought (1.13 and 0.97 Msun for A and B respectively). These values are now in excellent agreement with the latest asteroseismologic results. Our study, published in the January 8, 2015, issue of Nature, presents high-resolution spectra obtained from a sample of 23 evolved stars — 17 'S-type' and 6 'M-type'. 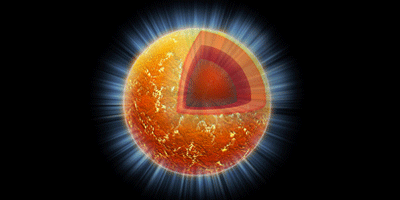 S-type stars are red giants in which the slow-neutron-capture or 's' process is synthesizing heavy elements, and M-type stars are similar giant stars with no s-process enhancement. Using the new spectrographic data (obtained with the HERMES/Mercator spectrograph) and dedicated model atmospheres, our study derives accurate technetium, zirconium and niobium abundances. Comparison with predictions from state-of-the-art stellar evolution and nucleosynthesis calculations points to a synthesis temperature of less than about 250 million kelvin in the S-type stars and supports carbon-13 as the s-process neutron source and suggest that and that heavy element synthesis began one million to three million years ago. Studying red giant stars tells astronomers about the future of the Sun — and about how previous generations of stars spread the elements needed for life across the Universe. One of the most famous red giants in the sky is called Mira A, part of the binary system Mira which lies about 400 light-years from Earth. In this image ALMA reveals Mira’s secret life. Mira A is an old star, already starting to throw out the products of its life’s work into space for recycling. Mira A’s companion, known as Mira B, orbits it at twice the distance from the Sun to Neptune. Mira A is known to have a slow wind which gently moulds the surrounding material. ALMA has now confirmed that Mira’s companion is a very different kind of star, with a very different wind. Mira B is a hot, dense white dwarf with a fierce and fast stellar wind. New observations show how the winds from the two stars have created a fascinating, beautiful and complex nebula. The remarkable heart-shaped bubble at the centre is created by Mira B’s energetic wind inside Mira A’s more relaxed outflow. The heart, which formed some time in the last 400 years or so, and the rest of the gas surrounding the pair show that they have long been building this strange and beautiful environment together. By looking at stars like Mira A and Mira B scientists hope to discover how our galaxy’s double stars differ from single stars in how they give back what they have created to the Milky Way’s stellar ecosystem. Despite their distance from one another, Mira A and its companion have had a strong effect on one another and demonstrate how double stars can influence their environments and leave clues for scientists to decipher. Other old and dying stars also have bizarre surroundings, as astronomers have seen using both ALMA and other telescopes. But it’s not always clear whether the stars are single, like the Sun, or double, like Mira. Mira A, its mysterious partner and their heart-shaped bubble are all part of this story. The new observations of Mira A and its partner are presented in this paper published in the European Journal Astronomy & Astrophysics, including authors A. Jorissen and C. Paladini from IAA-ULB. They complement the previous study made by the same team with the Herschel satellite. The star o Ceti was named Mira, the wonderful, by Johannes Hevelius in 1662 who was stunned by the appearance and disappearance of the star on the night sky. Meanwhile the star became a well-studied object due to its distance of only 300 light-years and today a whole class of late-type stars with long periodic light variations are named after Mira. The star was observed in many wavelengths and revealed different interesting features. In the present picture two previous images that were both Astronomy Picture Of The Day (2007-08-17 and 2006-07-22) and a new observation are combined. On the left, a GALEX observation in the ultra-violet by Martin et al. (2007) shows an extended 13 light-years long tail structure of Mira flying through the interstellar medium and on the right an X-ray observation with Chandra reveals Mira's binary nature (Karovska 2006). 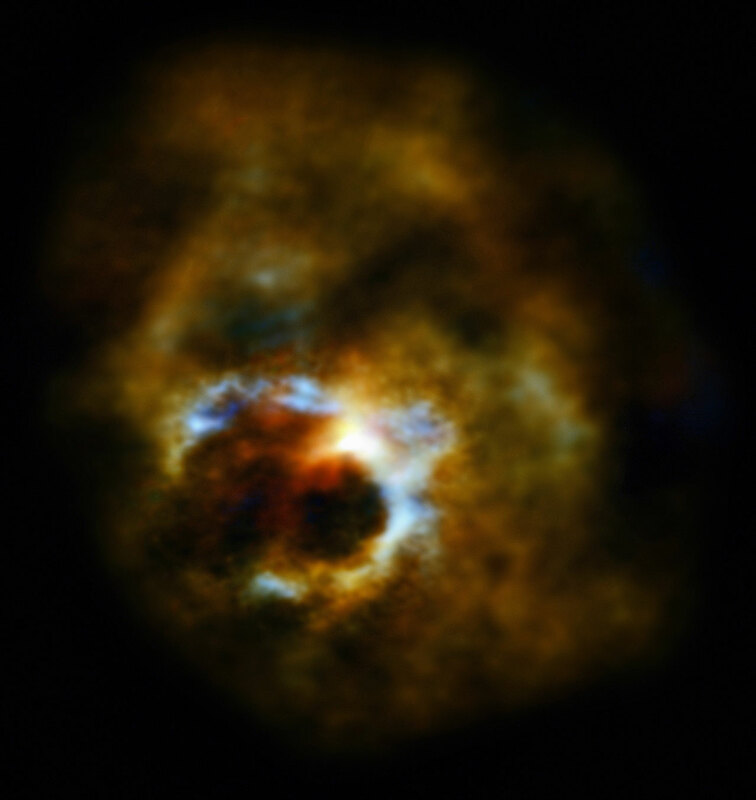 Late-type stars undergo massive mass loss in form of dusty winds which are visible in the infrared. New observations at far-infrared wavelengths with the PACS instrument on board the Herschel Space Observatory reveal arc-like structures in the expelled matter of Mira. They are interpreted as resulting from the perturbation of Mira's wind by the binary companion, combined with the 110 km/s motion of Mira through the interstellar medium. Panel (a): Deconvolved PACS/Herschel image at 70 µm. The arrow indicates the space motion and the position in 500 yrs; (b) is the same for the 160 µm band and (c) is the 70 µm deconvolved PACS image with contours and arcs labelled as A, B, C, D and E. The lowest contour is the 3σ threshold (and is depicted in white), the arrow labelled with Vspace shows the direction of the space motion, the bar labelled PA orbit gives the orientation of the major axis of the apparent orbit, orthogonal to the node line. Panel (d) results from a paraboloidal cut (representing the bow shock at the wind - ISM interface) in Mira hydrodynamical simulations of Mohamed & Podsiadlowski (2007, 2011). Nuclear fusion reactions in stars produce many elements found on Earth, but only those with atomic numbers up to that of iron. Heavier elements may have been created during previous supernova explosions of massive stars, or they may have been produced from the decompression of matter ripped from the crust of neutron stars, the super-dense remnants that those explosions left behind. If neutron stars indeed explain the origin of heavy elements, the composition of their crust (which varies rapidly with depth) should be reflected in the observed nuclear abundances. In Physical Review Letters, an international team of researchers, including Nicolas Chamel and Stephane Goriely from the Institute of Astronomy and Astrophysics at ULB, report new precision measurements of the mass of short-lived zinc nuclides. The new mass measurement supports a revised model of neutron-star crusts in which the zinc-82 is in fact no longer present, replaced by nickel-78, and allows us to "drill" deeper into the crust than before. Sudden pulsar spin-ups have long been thought to be the manifestation of a neutron ocean permeating the crustal layers of these dead stars. In a paper published in Physical Review letters, Nicolas Chamel from the Institute of Astronomy and Astrophysics at ULB shows that this interpretation fails to explain the large observed "glitches" in the emblematic Vela pulsar. 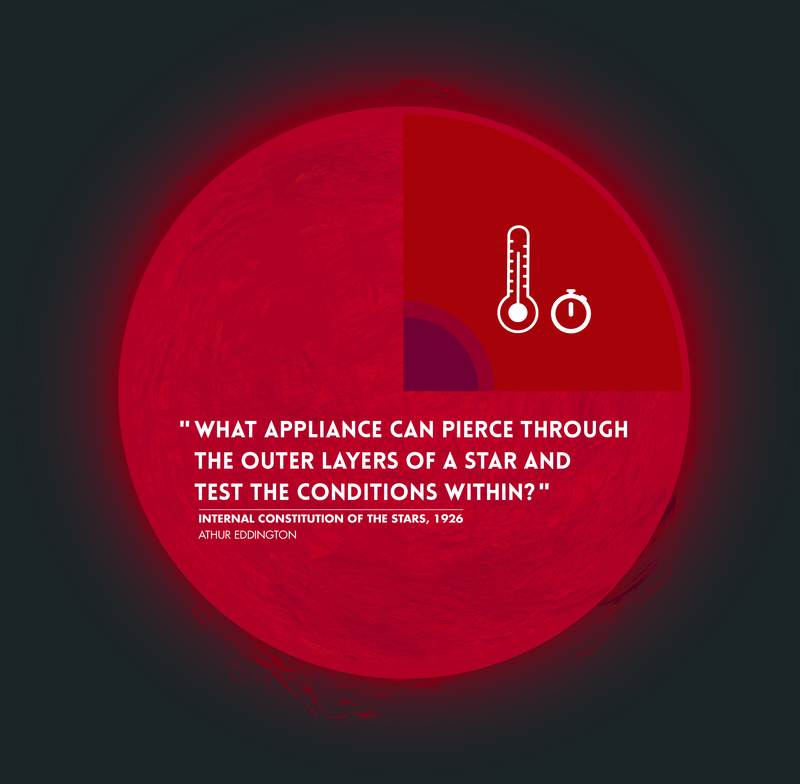 This conclusion has been independently confirmed by researchers at the University of Southampton. At the endpoint of stellar evolution, pulsars are spinning extremely rapidly with periods ranging from milliseconds to seconds and delays of a few milliseconds per year at most, thus providing the most accurate clocks in the universe. Nevertheless, some pulsars exhibit sudden decreases of their spin period. It has been widely believed that the free neutrons in the crust could rotate faster than the rest of the star until a critical lag is reached leading to the observed glitches. However, calculations indicate that this scenario is unrealistic because neutrons are very strongly coupled to the crust due to non-dissipative entrainment effects. The cosmic site where the heaviest chemical elements such as lead or gold are formed is likely to be identified: Ejected matter from neutron stars merging in a violent collision provides ideal conditions. 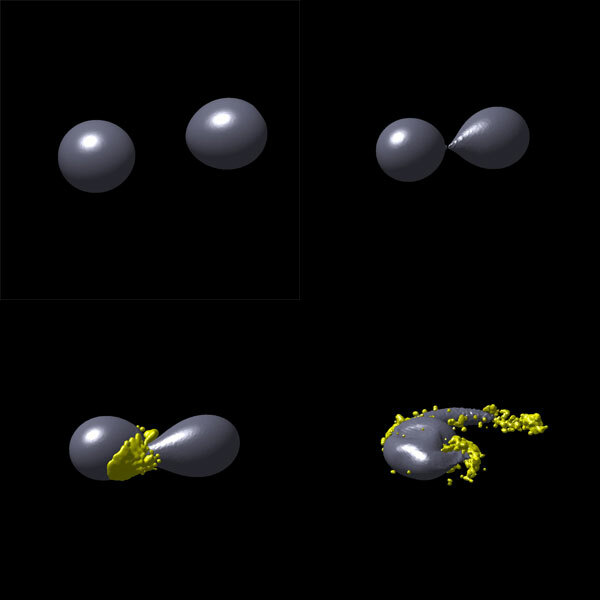 In detailed numerical simulations, scientists of the Max Planck Institute for Astrophysics (MPA) and of the Free University of Brussels (ULB) have verified that the relevant reactions of atomic nuclei do take place in this environment, producing the heaviest elements in the correct abundances. 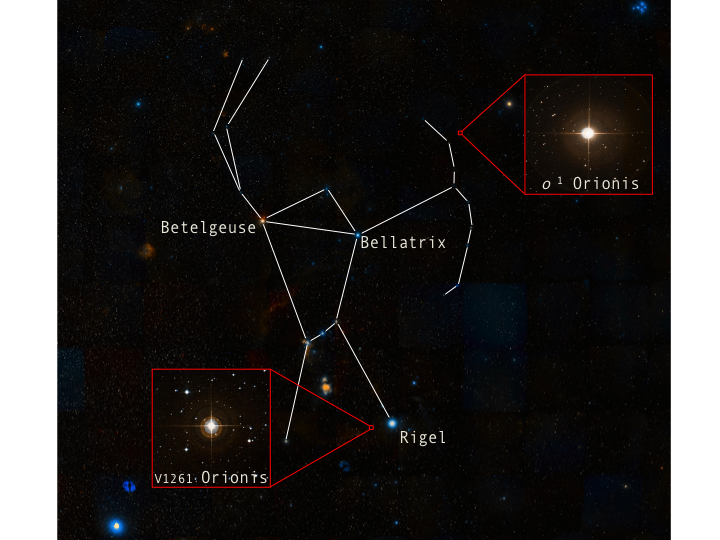 Using the VISIR instrument on ESO’s Very Large Telescope (VLT), astronomers (among which A. Chiavassa, from IAA-ULB) have imaged a complex and bright nebula around the supergiant star Betelgeuse in greater detail than ever before. 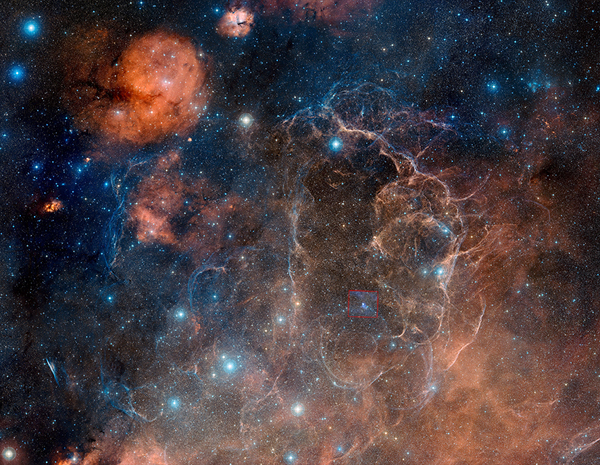 This structure, which resembles flames emanating from the star, is formed as the behemoth sheds its material into space.